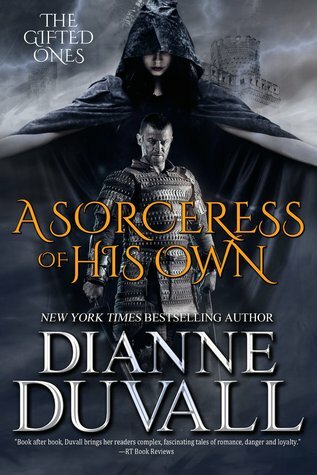 I just finished reading Dianne Duvall’s latest book, A Sorceress of His Own. It’s the first book in The Gifted Ones series. If you recall, Ms. Duvall writes the Immortal Guardians series—oh yes, the very yummy one with Seth and the other Immortals fighting bad vampires in North Carolina. I must confess that I don’t normally like historical romances. I was hesitant buying this one; however, I was far from disappointed. This story is set in the 1100s (specifically 1198)—not in the society circles in London. Ah,the ton! Yuck (just not my kind of reading). I loved both Lord Dillon and Alyssa. They both had really big hearts and tried to do the right thing, no matter the obstacle in their path. We also had a Seth and Roland appearance in the story. Yay! I didn’t initially catch it, but Marcus is also in the story so there is a bit of crossover from the Immortal Guardians. The secondary characters helped the story as well. Robert, Dillon’s brother, ended up being very dedicated to Alyssa once he found out her true identity. Additionally, several of Lord Dillon’s closest warriors protected Alyssa. I enjoyed seeing the change in their opinions toward her. I don’t want to spoil too much, but Alyssa was gifted with the power to heal. She did so throughout the story, never putting herself first. I loved her dedication to Lord Dillon and his men. There was a nice twist with Camden that I didn’t see coming. The ending rocked! I’m going to share a passage, hoping it won’t give too much away. At 95%…and yeah, sorry, this is a bit of a spoiler…you’ve been warned! Amusement rose up inside her despite her concern. He was so protective of her. And so very stubborn. Dillon had decided he would make his people love her, and still seemed to think he could actually accomplish such an impossible feat. Unfortunately, we will have to wait for the next one in the series. Rendezvous with Yesterday (Robert’s story) will be out in Spring 2016.